We Welcome New Orthodontic Patient’s — No referral is required! The goal of all Orthodontic treatment is to correct any misalignment of your teeth and jaw. At Parkview Dental, we provide Brooks Orthodontic Dentistry. Orthodontics has come a long way since wire braces were first introduced. It now includes a wide variety of Orthodontic treatment options including traditional wire braces, dental appliances, and now Clear Invisible Braces. 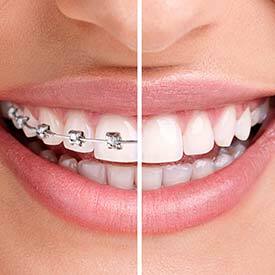 Traditional wire braces often left patients self-conscious about their smile, now with clear braces, being self-conscious about your smile is no longer a necessity. Clear Invisible Braces have revolutionized Orthodontic care. When you schedule your Orthodontic consultation, Dr. Struan Vaughan and Dr. Earl Pierson will identify the orthodontic option that best suits your needs. Please contact us today to schedule your complimentary orthodontic consultation to learn more about your treatment options. Q) What are the benefits of orthodontic care? A)Orthodontics treatments are considered a safe and effective way of treating teeth that are crowded. As well orthodontic treatment can be used to correct spaced teeth, crossbite issues, and other orthodontic problems. Ideally, the goal of a straight smile can be used as a confidence boost and is an immediate way to make a great first impression! By using orthodontic treatments such as clear braces, this can also benefit your overall oral health. By having properly aligned teeth, this can help prevent future dental issues like tooth decay and gingivitis, especially since brushing and flossing become easier. Also by improving any bite irregularities, you may have can also aid in your ability to chew and speak clearly. Q) How long is the typical Orthodontic treatment? The length of orthodontic treatment varies for each patient. The treatment length depends on the severity of your particular orthodontic concerns. Q) I am an adult, is orthodontic treatment just for teenagers? The short answer is NO! There is literally no age limit to wanting to have a perfect smile. Yes, it is ideal that orthodontic cases are treated earlier in life, many adults are taking advantage of today’s treatment options that were not available in previous years. Q) Does orthodontic treatment hurt? Orthodontic treatment should be relatively pain-free. While some patients do report a temporary discomfort with each new archwire, this typically goes away after just a couple of days. Q) Do I need to have teeth removed for successful treatment? Q) At what age should my child be examined for orthodontic care? If you feel your child might require orthodontic care, we suggest booking a complimentary consultation with Dr. Struan Vaughan and Dr. Earl Pierson. Treatment requirements all depend on the development stage of your child’s teeth, which progresses differently for each person. Q) Does my insurance cover orthodontic care? We hope you’ll take the first step towards your straighter, healthier teeth, and smile by booking your consultation at Parkview Dental today. Our team is here to answer all of your Orthodontic questions and concerns and to handle all of your family dentistry needs in Brooks.